SYDNEY — The federal government is putting nearly $800,000 into green-mining research being conducted by Yava Technologies and Cape Breton University. The money will be used by commercial researchers at the Verschuren Centre located on the university’s campus to test a pilot-scale plant that will extract waste metals and minerals from mining tailings. 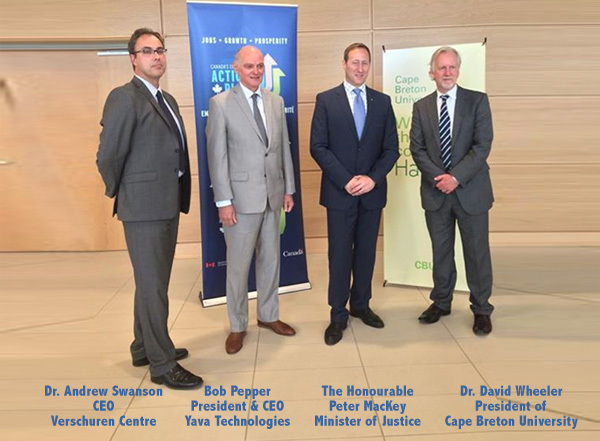 Central Nova MP Peter MacKay announced in a news release that $400,000 would come from the Atlantic Canada Opportunities Agency’s business development fund, along with $399,123 from Sustainable Development Technology Canada. The pilot testing will help establish viability of a full-scale operation that is expected to reclaim mining waste while reducing greenhouse gas emissions, and help shut down mines faster and more economically. Extending the life of a mine, minimizing industrial waste and extracting a higher purity product: lofty dreams for Cape Breton’s mining ancestors, may soon be a reality for this and future generations, thanks to the research and development being undertaken by Yava Technologies Inc.
Yava Technologies Inc. and its consultants, in partnership with Cape Breton University, will design, build and validate a pilot-scale mining plant to demonstrate a closed-loop process for treating a variety of complex mineral deposits and industrial waste. The Government of Canada is providing a $400,000 contribution through ACOA’s Business Development Program (BDP) to enable Yava to perform tests at the pilot plant scale. These tests will help establish the viability of a full-scale plant to successfully extract valuable minerals without releasing greenhouse gas. An additional benefit of this technology is that it will enable faster and more economical mine closure procedures due to reduced metal content in tailings. Sustainable Development Technology Canada is also contributing $399,123 to support this project. Yava Technologies Inc.’s state-of-the-art laboratory is located at Cape Breton University’s Verschuren Centre for Sustainability in Energy and the Environment. Yava has developed a high-tech, environmentally friendly mineral recovery process that eliminates the need for traditional mining equipment such as concentrators and smelters, and is designed to produce high-profit, value-added products for a variety of industries. Yava’s closed-loop process has the potential to significantly reduce the energy consumption of mining and certain industrial complexes. – Robert Pepper, President and CEO, Yava Technologies Inc. This five-year $2 million program will focus on developing innovative, economic and sustainable solution mining technologies to reduce environmental challenges posed by conventional mining and smelting techniques. Primary research and development will take place in the Verschuren Centre laboratories. Pilot program commercial work and additional research involving scaling of equipment will be undertaken in the new Verschuren Centre Commercial Demonstration Facility. The program also includes a further $500,000 investment from Enterprise Cape Breton Corporation (ECBC) related to the purchase of critical specialty equipment for the commercialization of the technology, which ECBC/ACOA recently announced. Verschuren Centre CEO, Dr. Andrew Swanson, concurs, “We are delighted to see the Yava relationship continue, especially with their focus on research, development and commercialization, which aligns perfectly with the Centre’s mandate and core strengths.” Included in the program’s positive economic impact are two new Verschuren Centre hires – a Green Mining Technologies Research Program fellow and a researcher. Vancouver, BC, October 31, 2013- Aurcana Corporation (“Aurcana” or the “Company”) (TSXV: AUN, OTCQX: AUNFF) wishes to provide an update. The Company is pleased to report the appointment of Mr. Bob Pepper, President & CEO of Yava Technologies Inc. (Yava), as a Technical Advisor. Mr. Bob Pepper has over 35 years of experience in management, finance and research. In 2008 he assumed the role of President & CEO of Yava, a company that has developed and patented a high-tech metal recovery process that has the potential to achieve higher recoveries and lower costs. Mr. Pepper will work with Aurcana in an effort to maximize the Company’s metal recovery processes and improve efficiencies. Separately, the Company wishes to announce the resignation of Mr. Nils Von Fersen, as Vice President Exploration effective October 31, 2013. Mr Von Fersen is being retained as a consulting geologist. The Company also reports that it has accepted Mr. Paul Matysek resignation from the Board of Directors and welcomes his transition to Aurcana’s Technical Advisory Board effective October 31, 2013. Aurcana Corporation is a primary silver producing company with two mines: the La Negra Mine in Mexico and the Shafter Mine in Texas, US. The Company is positioned to grow organically from its existing mines to become a senior silver producer. The Company’s shares are also traded in the United States on OTCQX under the symbol “AUNFD”. Investors can find current financial disclosure and Real-Time Level 2 quotes for the Company on www.otcqx.com and www.otcmarkets.com. CleanTech North is a consortium of tier one firms operating in Canada who are focused on accelerating the development of Canadian based clean-tech companies with the potential for global growth. Yava was invited to become a member of CTN and now meets regularly with the CTN sponsor corporations who are able to assist in all the areas of development that Yava may encounter. The sponsors include: the Royal Bank, Macquarie Bank, Price Waterhouse Coopers, GrowthWorks, and Gowlings.